Sherri Cassara Designs: Happy Monday! I had the most wonderful surprise today (Sunday). 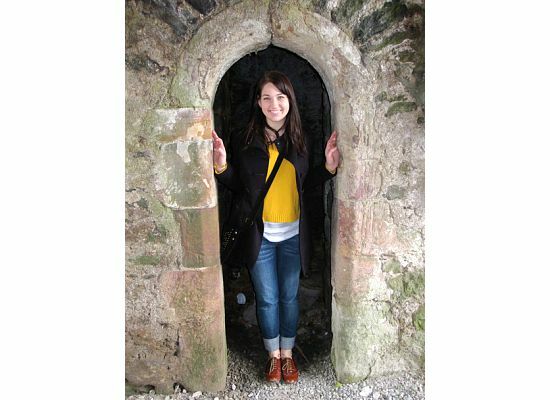 My daughter, the one who just turned 21, the one who is away at school, the one who spent her Spring break in Ireland and the one I miss so much showed up in my bedroom this morning and woke me up. She had taken an early flight this morning to spend twelve wonderful hours with us. My husband was in on the secret and he had gone early to pick her up from the airport. We haven't seen her since her birthday which was really only a few weeks ago but since she flew to Europe alone and stayed in hostels and all without a cell phone to communicate (which was harder than I thought it would be) it seemed like it had been ages since we had seen her. And I think she felt the same way. 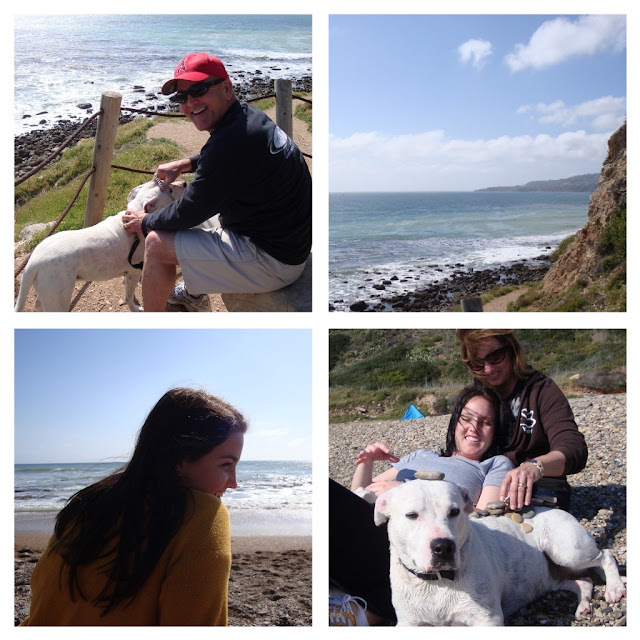 So we had a wonderful family day picnicking and "hiking" (well, not really hiking but we did have to walk up a pretty good hill) and catching up at the Trump Golf Course in Palos Verdes. We took our dog Milo and just hung out at the beach and watched him play with the other dogs and enjoyed the beauty that this day had for us. She does not go to school that far away. It is around 400 miles. Or a six hour drive. Or a one hour flight. Besides her normal school breaks, she has not come home like this before except for one other time that she just knew she needed to come home to have some time to breathe. When I picked her up from the airport on that spur-of-the-moment flight home, she was upset and apologetic and thinking she should not have spent the money to come home. I told her then that I thought she had made the right decision. She choose right. She chose herself. She is a girl who does the right thing for everyone else. She is conscientious and caring and makes good decisions. And I was glad that on that day, that she did what was right for herself. Not that I don't believe that we should put others first, and sacrifice for others. Because I do. But sometimes we need to listen to the voice inside ourselves and do what is best for us. That is what I loved so much about the poster, Are You Happy? when I saw it on my friend Barb's blog, Follow My Bliss. I think it just says it all. 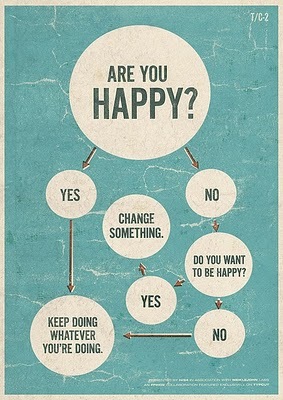 Are you happy? Great. Keep doing what you're doing. But if you are not ... shouldn't you change something? Choose something else? "You created the stories in your mind that continue to empower your limitations. Those beliefs create your reality and your outcomes. As you created those stories and beliefs, you can let them go now. JUST LET THEM GO. The Past is gone, it is over. You cannot change it. This is a new moment. USE IT WISELY. You have to nurture it, protect it, perfect it, and make it real. What stories or narratives that are not true are you continuing to believe? What do you need to let go of in order to achieve your dream? Wow... You left me speechless. Sherri, this is so profound! Now I understand your great mood on your comment. Having your dear daughter with you! What a beautiful surprise. I'm so happy to see your beautiful family. Lovely pictures. This post really inspired me. I truly LOVE your blog. Love... I mean it. So glad you were able to spend time with her....I keep telling my boys (college age) this same thing!!! Great post, as always you inspire me! Sherri, I adore this post it is all so very, very true!! I saw that you want to help little Charlie, and the Etsy items are on order, I know Sarah would set aside what you want! LOVE this post! It is so very true. If we don't care for ourselves first, we can't care for others. It's not selfish...it is a necessity. I'm so glad you had such a beautiful day together...she is adorable! The photos are wonderful ~ thanks so much for sharing. Sherri, this felt so moving to me! What a lovely young woman you raised. And for her to so obviously love you and be so mature at 21 seems to me unusual and remarkable. Wonderful! She is precious and I love your post! I'm glad you got to spend some quality time with her before she goes back to school. What a lovely story! I can't imagine life without having my daughter around, she brings so much happiness and sunshine into our lives ~ so I can picture your happiness on waking to find her in your home again!